Most of us know of electronic cigarettes and we can all admit that they indeed revolutionized smoking. But they haven’t been alone as this evolution in which every other form of smoking is going electronic has not spared even the hookah pipe. Hookah pens are the most recent and rising offshoot of a typical e-cigarette. Forget about hookah pipes because hookah pens come with a lot more. But what are they anyway? Well, a hookah pen is a specially designed electronic device that simulates the slow as well as calming experience tied to smoking hookah pipes only that it is convenient, stylish and friendlier to your health. Just like an e-cig, it has a battery, an atomizer and a cartridge as its main components. But unlike an e-cig, most of them utilize zero-nicotine e-liquids that come in fruit flavors inspired by tobacco. So to those who’ve quit smoking yet still wish to savor the thrill of physically inhaling some flavored vapor without putting their health at risk, this device is your savior. Today we’ll reveal hookah pens that deliver an insane amount of smoke-thick and white, just the same way a real hookah does. You might know them as a reputable e-cig brand in the United States but more interesting to note is that they’ve utilized their cutting-edge e-cig technology to come up with the best hookah pen for thick smoke. And unlike the garish and trashy colors so often seen in other hookah pens, NEWhere hookah pens come in brushed steel which not only makes them sophisticated but also gives them a refined feel. Use of natural flavor combinations that simulate relished and well known hookah flavors also gives them an edge over other e-hookahs, not to mention that you have a choice of 11 tasty flavors to choose from. Vapor wise, they deliver massive vapors enough to create long smoke rings. When it comes to power, its battery is strong enough to last you up to the 700 puff mark, depending on your vaping frequency of course. Each device costs $9.99 and after your purchase, you will receive a 1-year warranty and on top of that, a 30-day money back guarantee. White Rhino Blacklight hookah pens are essentially disposable hookah pens cherished by many for their remarkable capacity to fork out huge amounts of vapor per hit. White Rhino as a brand has for many years been associated with e-cigs but recently the company started to make E-hookah pens. Thanks to the inhalation sensor featured on its powerful battery, all you have to do to activate the device is inhale. Meaning you won’t need buttons or other sophisticated functionalities to power it. A combination of its large reservoir together with its powerful battery makes it possible for you to receive up to 600 hits before disposing it off. When you look at its small size, you will be tempted to doubt its ability but make no mistake about that. The vapor produced is still huge and besides that, you have a range of 12 delicious and traditional flavors to choose from. When making that transition from a traditional hookah to vaping, yet you badly wish not to lose that aesthetic value an actual hookah has, look no further than the Starbuzz E Hookah. To put it simply, it’s just a new and innovative version of the original hookah. Its design simulates the traditional hookah. Another great thing about is that it delivers clean, delicious an massive amounts of vapor without requiring that you have coals, shisha, water or those unnecessary items. To activate it, just inhale and you’ll be good to go. You can actually use 2 cartridges at a go which should be good news to those who like to match flavors. And for its huge price, Starbuzz e-hos primarily lets you enjoy the flavor, aesthetical value, and massive clouds of an original hookah and besides that, it’s a rechargeable hookah designed to serve you many, many, years to come. Want the best hookah for smoke that you can carry around and use all day? Vaporfi Boom Vapor Hookah Starter kit has everything you will ever need to make that a reality. Although it’s not as portable as every other hookah pen, it’s still small enough for you to carry around. One reason for this is because it was designed to look like a real hookah, something you will love to pass around at a party but this one has been perfected for individual use. One thing you are guaranteed to love about this e-hookah is its two tanks (1.3 ml). Each of these tanks can hold different flavors and if you wish you can smoke from one or both. You can as well use it with other flavors. Also included is a rechargeable 2200mAh battery and so you will no problems keeping your battery topped off. 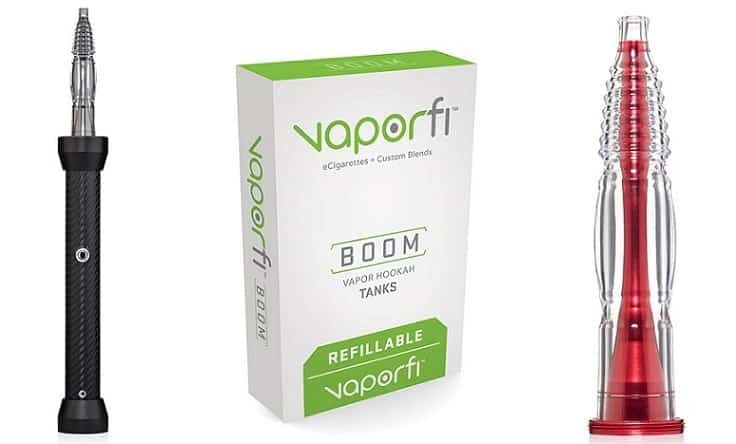 Vaporfi also featured a bubbling sound into this device which is a fun feature that makes it enjoyable to use your e-hookah anywhere and at any given time. While other companies rushed to create their e-hookahs, Fantasia took that opportunity to pick out features that seemed to impress people the most, excluded the negatives, and then released their e-hookah. So to put it simply, their hookah pen is a quality product worth years of research. Whereas a typical hookah pen will last between 250-600 puffs, a Fantasia hookah pen will take that a notch higher to 800, thanks to its powerful battery. Nicotine is known to be a little harsh to the throat and so by choosing to exclude it completely, the company set the stage for a smoother flavors and big clouds of vapor. Also important to note is that powering it only requires you to inhale .There will be an LED indicator lighting up as you do that. Its mouthpiece resembles the end of a hookah hose while its atomizer chamber features a smart chip powered by its lithium battery. What’s more, this hookah pens feature a few of current popular flavors relished by many hookah enthusiasts and it’s so portable you will love carrying it around. If you are a smoker who’s putting up a hard fight with the smoking habit and looks to staying away from nicotine, you need not look any further than any of the best hookah pen for thick smoke we just mentioned. Also, if you are just a vaping enthusiast out to enjoy massive clouds and exciting flavors, be sure to sort through our list to find that best hookah for smoke that suits you well. Lastly, if you wish to experience exceptionally dense and massive vape clouds, don’t purely rely on your heat management and set up, be sure to use the best hookah tobacco for thick smoke.